Chef of GourmetKickz is at it again with his color-matching mastery. 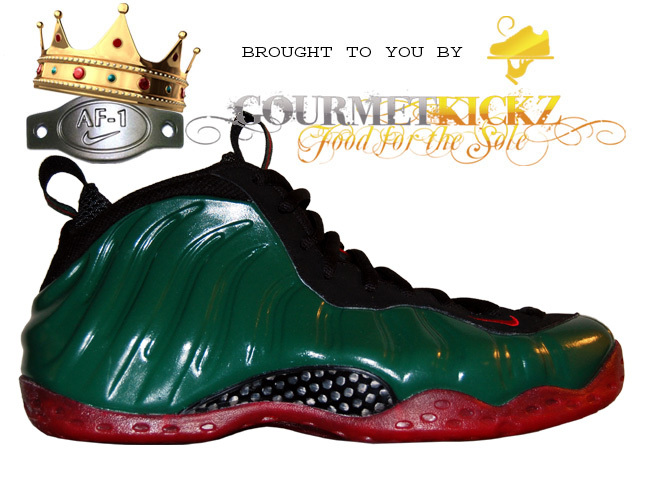 In this instance Chef has chosen the “cough drop” Foamposite One to create the above pictured “Gucci” Foams. The shoe color was derived from other Gucci inspired Nike releases and uses the same exact green present on these limited editions. Chef has produced a small run of these custom foams and is currently selling them for $400. The customs kicks also include hand painted pull tags to mimic the Gucci stripes. There is also talk of a limited box and snap-back package to be released.